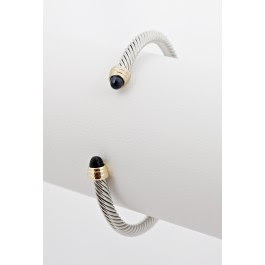 David Yurman's cable bracelet with black onyx tips retails for $595 at Saks. Mimi's The Look for Less has a fantastic lookalike option which retails for an extremely affordably $12! Click HERE if you're interested in purchasing. love it! great find J! I've never heard of this website before! Is it reliable? Have you had good luck?? just ordered 2 pieces....this coems at a great time! someone broke into my apt last week and took all my nice jewelry, which included 2 real david yurman bracelets!!! i gotta start somewhere, thanks! Tina - It's a new site, and yes, the products I've gotten from Mimi's have been fantastic! Great post, few days ago was my bday and i got a beautiful necklace from the Yurman,I know that the jewelry are super expensive. I was so happy to read your post,i just bought 5 cuff bangels. Can not wait to get it and i will write you back again for the feedback.